Heat oven to 425°F. Spray 1 1/2-quart round casserole with cooking spray. Chop chicken breasts. 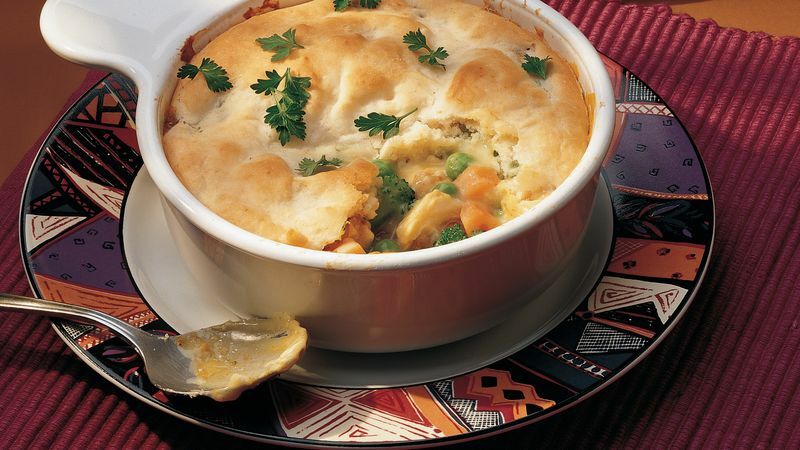 Mix chicken, vegetables, curry powder and soup; spread in casserole. Stir Bisquick mix and milk; pour over chicken mixture. Bake uncovered 25 to 30 minutes or until top is golden brown. Authentic Indian curry powder is freshly ground each day, and it varies dramatically depending on the region and the cook. We’re more likely to find a commercial curry powder near other spices in the grocery store. No Crispy Oven Chicken on hand? Go ahead and use any leftover cooked chicken, or buy the chopped cooked chicken sold in the freezer section of the grocery store.